(Nanowerk News) Researchers at Binghamton University are focusing on printed electronics: using inkjet technology to print electronic nanomaterials onto flexible substrates. When compared to traditional methods used in microelectronics fabrication, the new technology conserves material and is more environmentally friendly. Think of inkjet printing and you’ll likely picture an old printer in an office. Not so if you’re Timothy Singler, director of graduate studies and professor of mechanical engineering at Binghamton University. 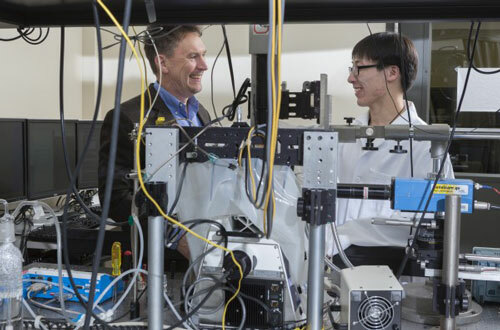 In the Transport Sciences Core at the Innovative Technologies Complex, Singler is collaborating with Paul Chiarot and Frank Yong, assistant professors of mechanical engineering, to study inkjet printing of functional materials. Timothy J. Singler, professor and graduate director of Mechanical Engineering at the Watson School of Engineering and Applied Sciences and graduate student Liang Liu, photographed at his lab in the Engineering and Science Building at the Innovative Technologies Complex. Functional materials are categorized in terms of the actions they can perform rather than on the basis of their origins. Solution-processed materials may have electrical, optical, chemical, magnetic, thermal or other functionalities. For example, silver is strongly electrically conductive and can be formulated into nanoparticle ink. However, Singler explains that printing with solution-processed nanomaterials instead of traditional inks is significantly more complex.